Bull calves in the dairy business are most often a topic that producers would rather not think about. The financial returns from selling them are usually low. There are unavoidable labor costs in their care. The sooner they leave the farm the better is the usual mantra. Too many of these critters become bob veal - early slaughtered calves with minimal economic value. Farmers are reluctant to put more time and effort into insuring a strong and healthy calf that has a good chance of entering a veal raising operation. This means holding on to these calves for some extra days risking the chance of scours or worse yet death. 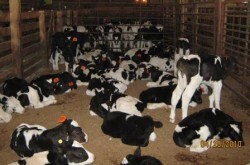 Veal managers do not want light, less vigorous and very young bull calves for fear of high loss rates as well. Experience tells them that larger and more active calves will do better and result in lower mortality rates and better feed conversion. There has been another issue creeping onto the scene, that of antibiotic residues in bob veal. Few people are bold enough to think that treating a young calf directly with injectable antibiotics will not result in detectable tissue levels if that animal enters the food chain within a few days. The problem is generally not from injectable products, but from oral scour medications, medicated milk replacers and more rarely colostrum containing antibiotics. Neomycin has been the most common culprit. Neomycin and tetracycline have both been included in some scour medications and milk replacers for many years. Labeling of these scour treatments can be misleading as to withdrawal times. Medicated milk replacers do not contain treatment levels of these antibiotics, but are formulated for use in heifer calves not calves destined for bob veal. Colostrum from cows treated with oil based dry treatments is most likely to carry residues of significance to the newborn calf. Dry treating less than the labeled days pre-calving, double tubing or treating a slack quarter can result in higher than expected first milking antibiotic levels. Holding out milk on fresh cows according to the labeled recommendations on dry treatment and not feeding it to bull calves is an extra measure of safety. The vast majority of colostrum will not cause an issue, however. Feeding heifer colostrum to bull calves is a failsafe way of preventing colostrum based problems provided that the practice of dry treating springers is not in place.